Irrigation of crops with water from the Columbia River, an economic activity that today consumes millions of acre-feet each year, began with the first permanent settlements along the river. One of the earliest, if not the first of these irrigation systems was the one constructed in 1818 by Donald McKenzie of the North West Company at Fort Nez Perces, the trading post he built near the confluence of the Walla Walla (the name means “many waters” in the Nez Perce language) and Columbia rivers. McKenzie irrigated the gardens around the fort via ditches from the Walla Walla River. The gardens were flourishing 18 years later, in 1836, when Marcus Whitman and his companion missionaries arrived. By 1840, Whitman was irrigating the garden at his Wailatpu mission, approximately seven miles west of present-day Walla Walla. His missionary partner, Henry Spaulding, also was irrigating the garden at his mission at the confluence of the Clearwater and Snake rivers. The town of Wallula was platted on the site of Fort Nez Perces in 1862, seven years after the fort, which had been renamed Fort Walla Walla, was abandoned during the Indian conflicts of 1855. In November 1856, the U.S. Army built a new Fort Walla Walla 28 miles east, at the site of the present-day city of that name. That fort also had irrigation ditches for its gardens. 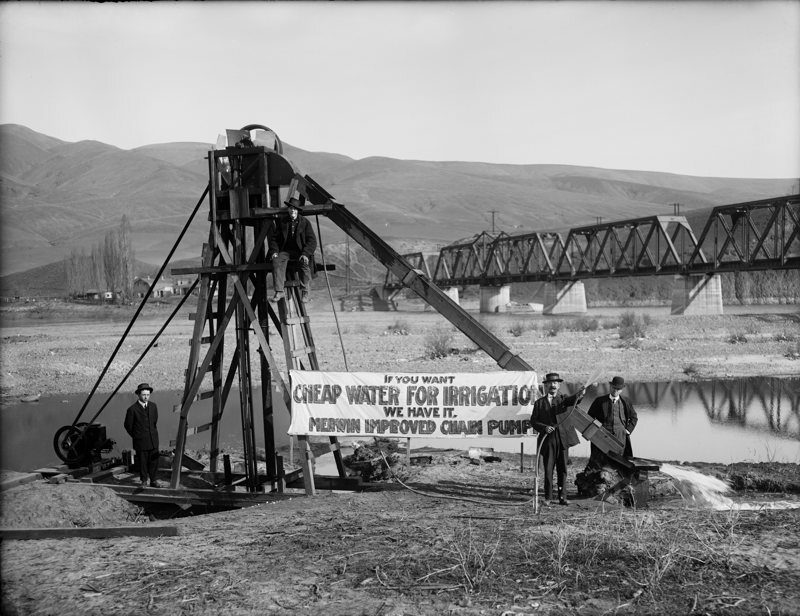 The first large-scale irrigation project in the Columbia River Basin was built in 1859 in the Walla Walla River valley. Water projects soon followed in the Umatilla, John Day and Hood River valleys of Oregon. Around 1880, a series of wet winters convinced potential farmers that rainfall really did follow the plow and that the Big Bend country of central Washington was not as dry and inhospitable as they had supposed. This spurred population growth in the region. At the same time, hard winters between 1880 and 1890 killed many cattle and spurred interest in wheat among ranchers. “It is a desert pure and simple, an almost waterless, lifeless desert,” he wrote, adding: “With irrigation properly conducted, it is safe to say that every foot of land now classed as desert will be found as productive as the regions more favored by rain.” After surveying the Columbia above Wallula, he estimated it would cost $3 million at least to make the river navigable (Nine years later, in 1890, Congress would appropriate $70,000 to start the work). Symons described the Hanford area as “a desolation where even the most hopeful can find nothing in its future prospects to cheer.” But he was not entirely pessimistic. He also recognized — in sage brush, surprisingly — the great agricultural potential of the rich, volcanic soils of the Big Bend country, site of the present-day Columbia Basin Project. The kind of sage brush Symons discovered roots deep and only grows in the richest soil. Thus, he recognized in the giant sage brush plants, some growing up to 12 feet tall, the tremendous agricultural potential of the area. In 1892, the Coulee City News reported on a proposal to irrigate the Big Bend country of central Washington state with water diverted into the Grand Coulee from a large dam on the Columbia River. The same story ran in The Spokesman-Review (Spokane) on September 28 with more details. A land developer named Laughlin MacLean proposed a 95-mile canal crossing the Big Bend of the Columbia in central Washington and carrying the entire flow of the Columbia. Later, he suggested a 1,000-foot-high dam to divert the Columbia into the Grand Coulee. Probably this is the first published proposal for a dam at Grand Coulee. The federal Reclamation Act, passed by Congress in 1902, authorized the government to aid the development of irrigation for agriculture and allowed settlers to own 160 acres for the purpose of irrigating crops. In the Columbia River Basin, the Reclamation Act led to an increase in irrigated acreage from 500,000 acres in 1900 to 2.3 million acres by 1910 (irrigated acreage grew to 2.9 million by 1925, 6.6 million by 1966, 7.6 million by 1980 and increased through the 1980s at about 53,000 acres per year). 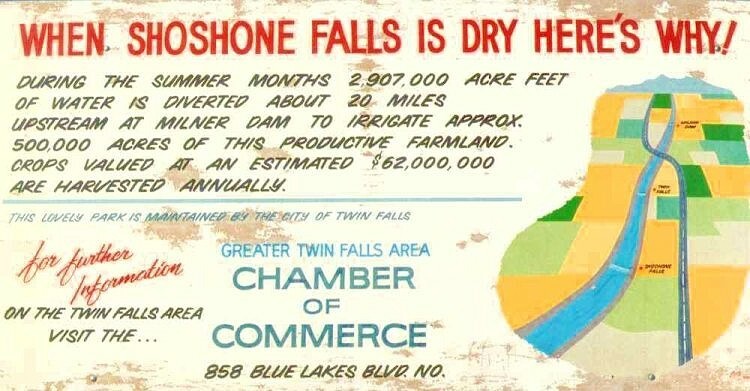 By 1928, some 3.5 million acres of farmland in the Columbia River Basin were being irrigated. Water appropriators, both on the government [Yakima Basin] project and on the private projects which had already appropriated all of the low water flow, have vested rights which could not be taken away from them unless they were paid for such rights. As there are about 100,000 people living in the Yakima Valley, all dependent on irrigation, I do not believe any serious argument could be made that the water should be taken from the farms and orchards to improve fishing conditions. In 1943 Congress created the Columbia Basin Project in central Washington, the largest irrigation project to divert water from the mainstem Columbia River. The project is managed by the Bureau of Reclamation and the Interior Department. The authorizing legislation, the Columbia Basin Project Act, replaced the Anti-Speculation Act of 1937, which President Roosevelt had sought as a means of guaranteeing that people who settled in central Washington to take advantage of the irrigation water and power from Grand Coulee Dam would not be subject to inflated prices from land speculation. The Columbia Basin Project Act required the Bureau of Reclamation to sign contracts with three irrigation districts that had been established within the Project. Power revenues would subsidize irrigation. The law also required that farm owners could not sell their land for five years for more than the appraised value before irrigation improvements. President Roosevelt signed it on March 10, 1943. The project was envisioned as 1 million acres, but it never grew beyond about 500,000 acres. Over time, irrigation projects burgeoned throughout the Columbia River Basin but particularly in southern Idaho, central Washington and parts of northeastern Oregon. Irrigation affects fish, particularly migratory fish like salmon and steelhead, not only by reducing stream flows — this can lead to increased water temperatures and the deterioration of shoreline habitat for fish — but also through water diversions. Diversions that are not screened to keep fish out can capture and divert fish into fields or pumps. In 1995, the National Research Council reported that the principal impacts of irrigation on salmon and steelhead no doubt stem from these diversions, but in the same year the Independent Scientific Group (ISG) reported that no comprehensive ecological assessment of the consequences of irrigation on fish in the Columbia River Basin ever had been conducted. The ISG also pointed out the obvious, however, that dams and water diversions for irrigation can block movements of migratory fish and send them into ditches and diversions, where they will die. Diversions also can dry out natural fish habitats. Water in irrigation ponds and reservoirs typically is much warmer than in free-flowing streams, the ISG reported. As well, water that returns to streams from fields can be warm and laden with agricultural chemicals, creating inhospitable water quality conditions for fish. Irrigation is a big business. Today, about 5.1 million acres are irrigated with water from the Columbia River and its tributaries. This is a reduction from the historic high, which was 9.2 million acres in 1980. In 1990, the amount was about 8.4 million acres. The largest areas of irrigated acreage are in southern Idaho, eastern Washington and eastern Oregon. Nearly all of the potatoes, sugar beets, hops, fruit, vegetables, and mint grown in the Columbia River Basin are irrigated, as are large crops of hay and grain. Water withdrawals for irrigation take water away from hydropower production. Irrigation is the largest non-hydropower use of water in the Columbia River Basin. Sign explaining irrigation diverting water from falls. Photo: USGS. 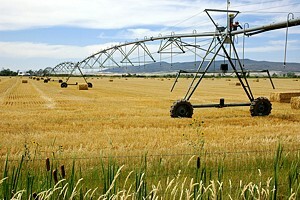 Irrigation equipment in Eastern Idaho. Photo: Rodd Halstead.